OSU Extension will be offering Annie’s Project in Putnam County this coming January and February. The program brochure with registration information can be found here:2019 Putnam County Annie’s Project. Please contact Beth Scheckelhoff at 419-523-6294 or scheckelhoff.11@osu.edu with questions or for more information. Are you curious about what is happening around the state with regard to weather conditions, how crops are fairing, and the ability for farmers to get out into the field? The USDA’s National Agricultural Statistics Service (NASS) provides this information each week from April through November in The Crop Progress & Condition Report. A group of volunteer reporters across the state provide feedback on these topics each week. The NASS compiles the data and publishes a report each Monday by 4 pm. Reports dating back to 2015 through the most current posting can be accessed here. The website also allows you to subscribe to receive updated reports and other information via email! Hopefully, this information will be useful in your daily operations! In 2015, EPA revised the Agricultural WPS originally enacted in 1992 to increase protections and reduce risks for agricultural employees and their families exposed to pesticides on farms, in forests, greenhouses and nurseries. This brief introduction will help determine if you fall under the revised WPS guidelines. Additional resources and the complete guide HOW TO COMPLY WITH THE 2015 REVISED WORKER PROTECTION STANDARD FOR AGRICULTURAL PESTICIDES are accessible via the Pesticide Educational Resources Collaborative (PERC) website, http://pesticideresources.org//index.html. Do you have responsibilities under EPA’s Worker Protection Standard (WPS)? The answer is YES if you are an agricultural employer, defined in the WPS as any person who is an owner of, or is responsible for the management or condition of an agricultural establishment, and who employs any worker or handler. What is an agricultural establishment? An agricultural establishment is involved in growing, maintaining or producing agricultural plants (including fruits and vegetables; flowering and foliage plants and trees; seedlings and transplants) for commercial and/or research or experimental purposes. Commercial production includes production of plants for sale, trade or in-house use on the establishment or another facility. Nurseries, garden centers and similar operations where nursery and ornamental bedding plants are maintained for wholesale or retail sale are considered agricultural establishments for the purposes of the WPS and are covered by the rule if they use WPS-labeled pesticide products. How do you know if a pesticide invokes WPS? 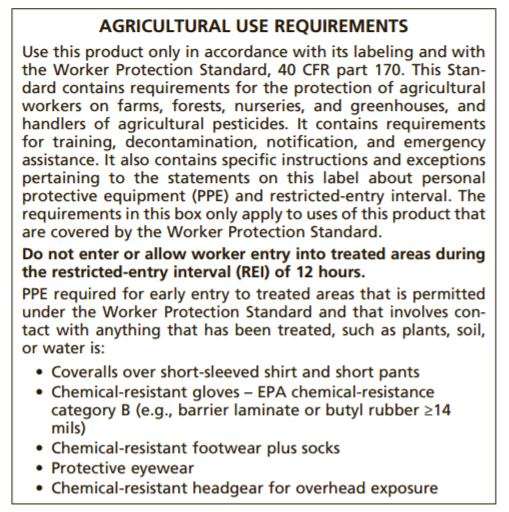 The Agricultural Use Requirements box located on the pesticide label indicates that the product falls under WPS guidelines. Figure 1. 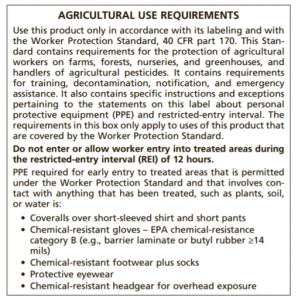 The Agricultural Use Requirements box on a pesticide label invokes WPS requirements. Do you employ workers or handlers? A worker is anyone who is employed (including self-employed) in exchange for a salary/wages/other monetary compensation, and doing tasks directly related to the production of agricultural plants on an agricultural establishment (i.e., harvesting, weeding, carrying nursery stock, repotting plants, pruning or watering). Performing tasks as a crop advisor during any pesticide application, during any restricted-entry interval, or before any inhalation exposure level listed on the pesticide product labeling has been reached or any ventilation criteria established by WPS (Chapter 3, Table 1. Entry Restrictions During Enclosed Space Production Pesticide Applications) or on the pesticide product labeling has been met. Are you exempt from some WPS requirements? The owners of agricultural establishments and their immediate family members must comply with some but not all WPS requirements provided that more than half of the equity in the establishment is owned by one or more members of the same immediate family. The definition of an immediate family member was expanded to include: spouse, parents, stepparents, foster parents, father‐in‐law, mother‐in‐law, children, stepchildren, foster children, sons‐in‐law, daughters‐in-law, grandparents, grandchildren, brothers, sisters, brothers‐in‐law, sisters‐in-law, aunts, uncles, nieces, nephews, and first cousins. Owners must provide full WPS protections for workers and handlers that are not immediate family members. Any worker enters a treated area where a WPS-labeled pesticide product has been used or a REI for such pesticide has been in effect within the past 30 days. Any handler conducts any handling task (see above for a list of handler tasks). Workers and handlers are exempt from WPS training if they are a certified restricted-use pesticide applicator, a certified crop advisor, or if a worker has been trained as a WPS handler within the last 12 months. Employers must train workers and handlers annually, once every 12 months from the end of the month when the previous training was completed. Qualified WPS trainers can include a certified applicator of restricted-use pesticides, a trainer of certified pesticide applicators, handlers or workers by the EPA, federal, state or tribal entities; or someone who has completed an EPA-approved pesticide safety train-the-trainer program. Training must be provided in a manner that employees can understand. Several EPA-approved resources for training employees can be found in English and Spanish with or without closed-captioning at the Pesticide Educational Resources Collaborative (PERC), http://pesticideresources.org//index.html. OSU’s Pesticde Education Safety Program is offering free WPS workshops that provide employers and managers what they need to bring their WPS program in compliance with the new requirements, including changes in training, restrictions during applications, personal protective equipment, decontamination supplies, recordkeeping, and more. Several workshops are scheduled in the next few weeks (WPS workshops flyer). Please click on one of the following dates to register! If you are involved in the production of fresh produce, you have likely heard about FDA’s Food Safety Modernization Act (FSMA). President Obama signed FSMA into law in 2011, granting FDA the authority over preventive and risk-based standards for growing, harvesting, packing, processing, and distributing domestic and imported food for humans and animals. The Produce Safety Rule (PSR) is one of seven foundational rules enacted by FSMA and the one most directly affecting produce growers. PSR’s primary focus is preventing biological safety hazards (i.e, microorganisms that cause human illness) in the growing, harvesting and post-harvest handling of fresh fruits and vegetables. Much of the language and terminology presented here is taken directly from the FSMA-PSR as published in the Federal Register. The complete rule and guidance documents can be found on the FDA FSMA Website: http://www.fda.gov/Food/GuidanceRegulation/FSMA/. Must You Comply with FSMA-PSR? The first question any producer must answer is whether they meet the regulation’s definition of a “farm”. The two lengthy definitions of a “farm” provided in the PSR are intended to distinguish owner-operated production sites and off-site packing locations from commercial facilities. 1.) A Primary Production Farm (PPF) is a farm operating under one management in one general physical location (does not have to be contiguous) devoted to the growing of crops, the harvesting of crops, the raising of animals, or any combination of these activities. 2.) A Secondary Activities Farm (SAF) is an operation not located on the PPF that is devoted to harvesting, packing, and or holding raw agricultural commodities (i.e, produce in its raw or natural state), provided that the PPF that grows, harvests, or raises the majority of raw agricultural commodities harvested, packed, or held by the SAF owns, or jointly owns a majority interest in the SAF. If you do not meet the FDA’s definition of a PPF or SAF, then you are not covered by the FSMA-PSR; however, you might be subject to one of the other six foundational rules, such as the FSMA-Preventive Controls Rule. While all growers should be aware of the food safety risks on their farm, some may be excluded from the rule or eligible for an exemption. 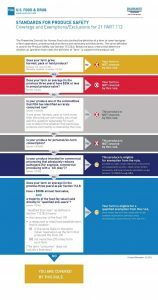 FDA has provided a flow diagram for determining whether produce from your farm is excluded from the rule, qualifies for an exemption, or is subject to the rule (below, http://www.fda.gov/downloads/Food/GuidanceRegulation/FSMA/UCM472499.pdf). The produce undergoes commercial processing to reduce the presence of microorganisms of public health significance (i.e., there is a “kill step”). If your farm has food sales (not just produce sales) averaging less than $500,000** per year during the previous hree years; and the farm’s sales to qualified end-users exceed sales to all others combined during the previous three years (i.e., more than 50%). A qualified end-user is either (a) the consumer of the food or (b) a restaurant or retail food establishment that is located in the same state, the same Indian reservation as the farm, or not more than 275 miles away. ***Proving eligibility for the qualified exemption requires three years of sales records to support the exemption. Business size determines compliance date as well as when you need to begin collecting sales records (Table 1). 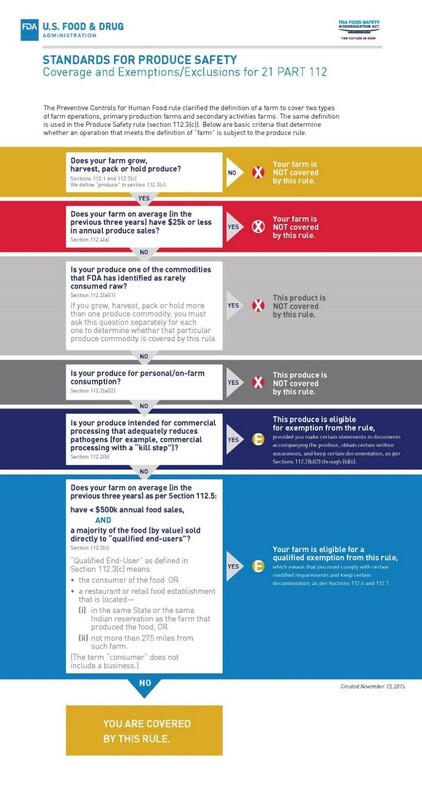 ***Farms receiving a qualified exemption must also prominently display their farm name and address on produce labels or at the point of purchase. Contamination of fresh produce from human pathogens generally occurs via these primary sources: humans, animals, water, soil, and/or the surfaces of equipment, tools and buildings. The FSMA-PSR addresses each of these sources and establishes science-based minimum standards for the industry to follow in the growing, harvesting, packing and holding of covered produce. 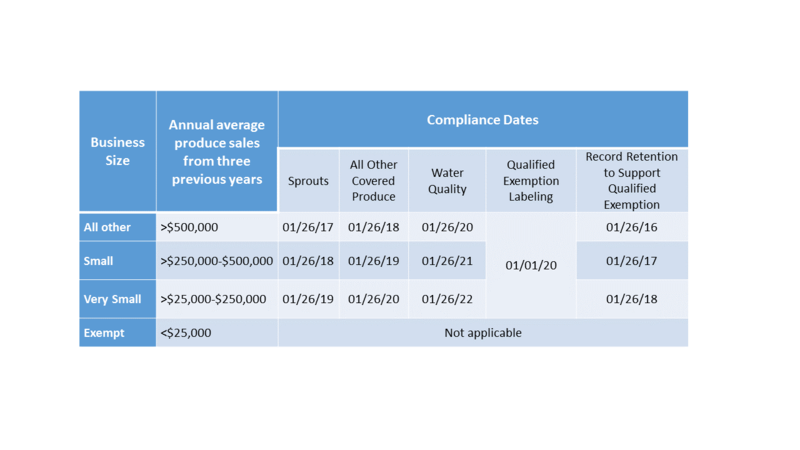 Compliance dates for standards vary according to business size and for different parts of the rule (see Table 1 below). For example, standards specific to the sprout industry must be implemented earlier than other types of covered produce. 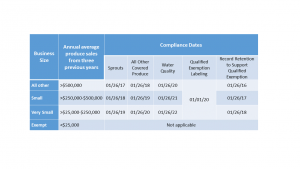 Growers also have two additional years to comply with water regulations beyond their compliance date. Table 1. FSMA-PSR compliance dates by business size. In addition, the FSMA-PSR requires at least one supervisor or responsible party from each farm subject to the rule to complete food safety training from a FDA-approved standardized curriculum before their compliance date. Currently, the Produce Safety Alliance (PSA)(producesafetyalliance.cornell.edu) offers the only FDA-approved grower training course to satisfy this requirement. The PSA course educates growers on preventing biological safety hazards from contaminating produce on the farm by assessing produce safety risks, implementing produce safety practices (i.e., Good Agricultural Practices (GAPs)), monitoring practices, using corrective actions, and maintaining records. Growers interested in attending a PSA grower training workshop can find registered classes at the following link: https://producesafetyalliance.cornell.edu/training/grower-training-courses. Additional classes will be offered as more trainers become certified to teach the workshops. It’s hard to believe that the new year begins in just a few days. Where does the time go? It is important to take time to reflect on the past year and make plans for the year ahead. Establishing personal goals and business goals is an important process to stay focused on what really matters most to you. Think of goal setting as a road map, a charted course that guides you to your final destination. When you get off track or take a wrong turn, reviewing your goals can help you refocus on what really matters. We are wise to consider the words of Stephen Covey, author of The 7 Habits of Highly Effective People, “Begin with the end in mind.” Can you envision changes in your life that you cannot see today? Where would you or your business like to be one week, one month, or one year from now? How would your personal life or business look different? Would you have a new skill or hobby? Would you finally have your checkbook balanced or your business finances in order? What steps do you need to take to achieve these goals? S: Specific. Is your goal specific? You have a much greater chance of reaching a goal when it is carefully detailed than when it is vague. Ask the 5 W’s: who, what, when, where, and why? to nail down the specific elements of your goal. For example, perhaps your goal is to “eat healthier”. If you specifically state that your goal is to “Eat a nutritious breakfast 3 mornings per week during the school year,” then you have provided sufficient detail to understand what the goal “eat healthier” means to you. M: Measurable. How will you know if you have reached your goal? Can you measure this is some way? Develop a method to measure progress toward your goal. In this example, you could keep a journal or mark on a calendar which days you ate a nutritious breakfast. If after a few weeks, you notice there are no checkmarks – then go back and review your goal and to get back on track. A: Attainable. Can your goal be reached? Do you have the right skills, attitude, and ability to attain this goal? Do you need to grow in certain areas or to work to obtain the necessary skills? For example, if someone else in the family does the grocery shopping and meal preparation, then you likely need to plan ahead and determine a weekly or monthly breakfast menu, including a grocery list of items needed. R: Realistic. Is your goal realistic? Perhaps your kids need to be at school early each day, and you struggle to get ready and out the door on time. Making a nutritious breakfast each morning might be difficult without properly planning ahead and preparing some items the night before. In this scenario, three nutritious breakfasts might be most realistically achieved on Saturday and Sunday mornings, and one other morning during the week. T: Time-based. Is there a timeframe attached to achieving your goal? “Someday” is vague and allows too much flexibility and ability to avoid your goal. Eating a nutritious breakfast 3 days per week during the school year indicates how often and how long this goal will be in place.